Pepper Shot is a 10% pepper spray, manufactured by Safety Technology, a world leader in self-defense products for the last 30+ years. This pepper spray is rated at 2 million scoville heat units. It is made with a very fine grain, which proves to be moare effective than the coarser, larger grains of most other defense sprays. This pepper spray not only caused the attacker pain, but swells the mucous membranes, which makes breathing extremely difficult. It also causes the veins in the eyes to swell, which causes the eyes to close. These effects last 20 to 30 minutes and will cause no permanent damage. All key chain sprays have quick-key releases, so your keys can be disconnected very quickly. They also have locking actuators, to prevent the the spray from discharging by accident. It comes in four colors, black, red, blue and pink! 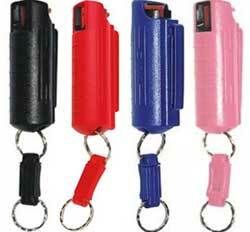 This Pepper Shot Pepper Spray 1/2 Oz w/Colored Injection Molded Holster can be delivered in 3 to 5 business days. If you would like to receive your order sooner, guaranteed 3 day, 2 day and next day delivery options are available upon checkout. Orders placed by 2:00 PM central time ship the day they are placed. If you have any questions or concerns call our customer support staff at 800.960.2015 or click the live chat button at the bottom of this page. Our courteous and professional customer support team is always glad to help!